Jonathan Pruitt, an internationally recognized evolutionary ecologist, will be joining McMaster University as the Canada 150 Research Chair in Biological Dystopias ­– part of a program introduced by the federal government to attract the world’s top researchers and scholars to Canada. The announcement was made in Ottawa today by Minister of Science, Kirsty Duncan. Pruitt, who comes to McMaster from the University of California, Santa Barbara, studies how the collective traits of different animal societies – including those of ants, wasps and spiders – affect their survival. “My research explores what it takes for animal societies to succeed and why it is that so many societies wither and die,” says Pruitt who creates experimental social groups made up of contrasting organizations, compositions, architectures and collective attributes, and then subjects them to a range of ecological challenges. “I monitor their performance to observe what traits enable some societies to proliferate and take over a landscape, what traits are associated with infighting and demise, and what enables a small number of societies to bounce back from could-be extinction,” he says. Pruitt, who grew up in Florida, but whose family is originally from Southern Ontario, says coming to McMaster will provide him with an opportunity to broaden his research program. Jonathan Pruitt is a world-leading researcher studying biological dystopias, specifically the collapse of spider colonies. Today, it was my absolute pleasure to announce that he is bringing his great mind to Canada (McMaster University) as a Canada 150 Research Chair! Meet Jonathan live for a Q&A.Jonathan Pruitt est un chercheur renommé international dans les études des dystopies biologiques, précisément la chute de colonies d’araignées. Aujourd’hui, j’ai eu le plaisir absolu d’annoncer que Jonathan amène son esprit brillant au Canada (à l’université McMaster) en tant que Chaire de recherche Canada 150! Rencontrez Jonathan en direct pour une séance Questions-Réponses. McMaster’s Vice-President of Research, Rob Baker, says Pruitt’s appointment speaks volumes to both the reputation of McMaster’s Faculty of Science, and the importance of creative government funding programs. Maureen MacDonald, dean of the Faculty of Science, says Pruitt’s work will have a significant impact in the field of animal behaviour and will build on the Faculty’s already defined strengths in this area. 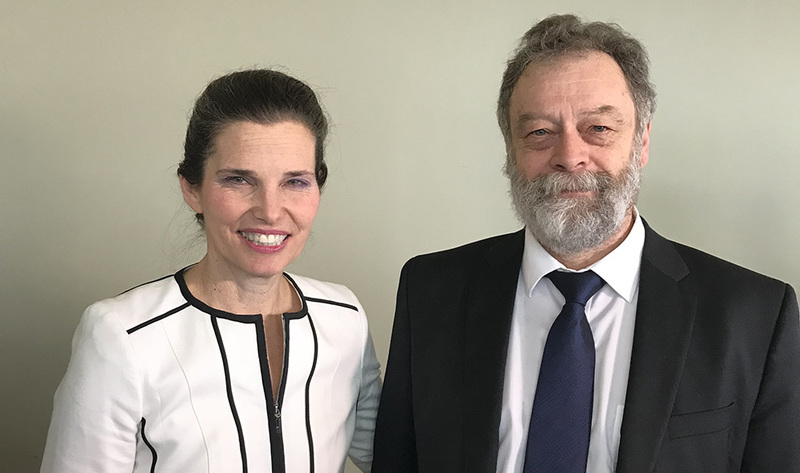 Minister Kirsty Duncan meets McMaster’s Vice-President Research Rob Baker at the government’s Canada 150 Research Chairs announcement. 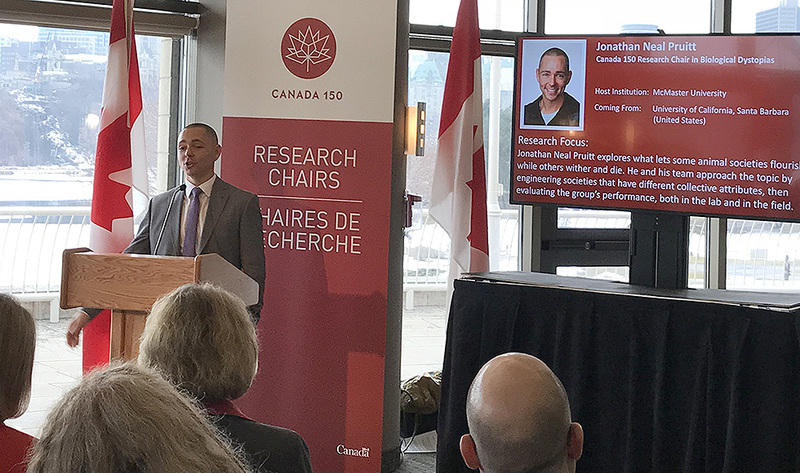 The Canada 150 Research Chairs Program, announced in the 2017 federal budget, is a $117.6 million investment aimed at enhancing Canada’s reputation as a global centre for science, research and innovation excellence in celebration of Canada’s 150th anniversary. It provides Canadian institutions with a one-time investment to attract top-tier, internationally-based scholars and researchers to Canada. Canada 150 Chairs are selected through a rigorous, in-depth process in which applications are reviewed by experts in the candidate’s field of study and by a multidisciplinary panel made up of world-leading and international researchers. Chairs are also awarded based on the quality of the institutional environment and the level of support that will be provided to ensure the success of the research program.